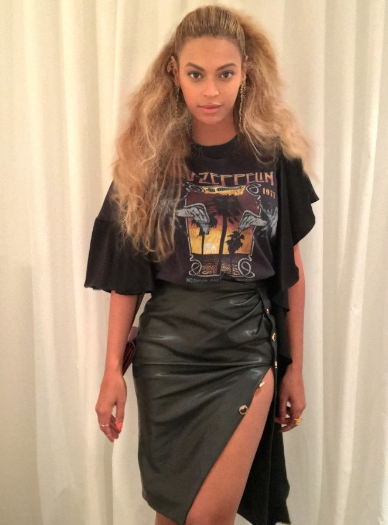 –Beyonce posted some behind-the-scenes photos of her at the Kanye West concert and the internet freaked out over her apparent superhero power to reverse-age. -Good job on Natalie Portman for announcing her pregnancy right before landing at TIFF and avoiding all the red carpet belly bump speculation. -Do you think Lindsay Lohan keeps using the #nofilter hashtag when she posts Snapchat filtered pics ironically…or? –Michael Jackson‘s daughter might be married to a pizza delivery guy. –The Flash gag reel is basically 11 minutes of the cast dancing and Tom Cavanaugh screwing up. -I knew there was no shot in hell that Manu Bennett would reprise his role as Deathstroke for the big screen, but Joe Manganiello? Really? –Johnny Depp is circling around being the *star* of a movie about Biggie and Tupac? Go home, Hollywood. You’re drunk. -Ben-Hur is now on track to lose $120M or more. Why isn’t no one hand-wringing about this like they were about Ghostbusters? -Oh god, this is terrible: Melissa George was reportedly hospitalized after allegedly being assaulted by her boyfriend. Horrific if true. -I very briefly considered going to Michael Fassbender‘s TIFF soiree (until I saw that tickets were over $600 each). But at least it sounded like a good time. –Madonna posted some pointed Instagrams after settling the custody battle over son Rocco. -Well, it’s official: TV has now surpassed movies. Meryl Streep is going to star in a new show. –Liam Hemsworth posted a cute #TBT with Miley Cyrus. I had totally forgot/repressed that they starred in a movie together. -A bald and desperate Matthew McConaughey is digging for treasure in the first Gold trailer.